We are in the process of wrapping up final thoughts on the iPhone 6, but while it’s still in hand and on our minds, we wanted to compare it to a couple of interesting Android devices that are doing the opposite of today’s smartphone trend – going smaller. 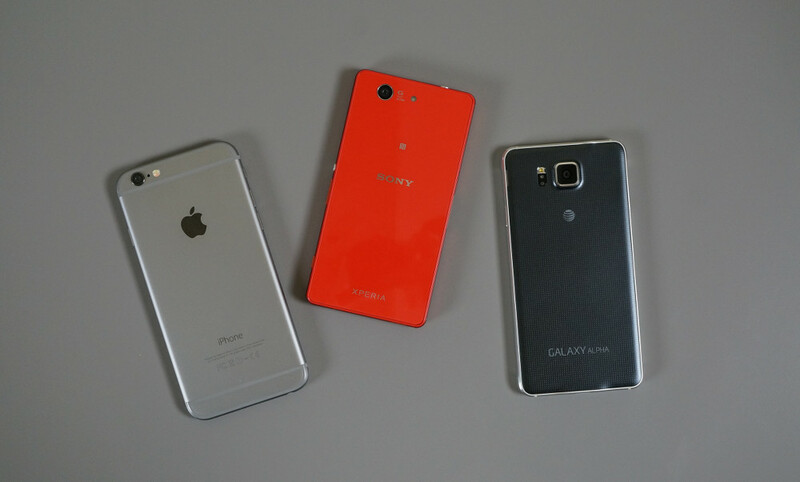 The Samsung Galaxy Alpha and Sony Xperia Z3 Compact carry flagship-level specs, but weigh in with smaller bodies and slightly lower-resolution displays, which just so happen to match up nicely to the new iPhone. Funny how Apple went bigger by using a 4.7-inch display, yet these Android phones are technically “small” with their 4.7-inch and 4.6-inch displays. In the video below, you will see how the size of the new iPhone compares to not only the Galaxy Alpha and Z3 Compact, but also to last year’s Moto X, since it carries a 4.7-inch display as well. Apple’s new iPhone is certainly considered by all to be a flagship-type device, but with similar specs in these Android phones, I get the feeling that most are struggling to consider them true flagships. It’s an interesting area to examine. Standards set on each side of the table collide here. Feel free to take a look to see how the “small” high-end devices stack up to the “big” new iPhone 6.